wow!! this book taught me so much about life and the human nature. sometimes i put down the book because the intensity of David's determination and passion for life just blows me away and quickens my pulse.I have to say David is one of my beloved heroes.His struggles are a great lesson and helped many others. This is part of a four book series (five if you count the one from his brother). It continues the story and gives hope that even despite an abusive, unregulated childhood, a person can grow up to be a great member of society. You should read the others first, it would be the best thing to do as it incorporates things in the previous novels. Oh my this book has brought courage in my life. I have been through almost the same thing, except it wasnt my mother that did it to me. It was my stepfather. From ages 6 to 13 I was sexually abused by my stepfather. Then I was raped by a 23 year old at age 14. I am 15 now. I read all his books and it gave me the courage to tell the police what he did to me. My biological mother neglected me and so did my biological father. David Peltzer you are my all time hero. 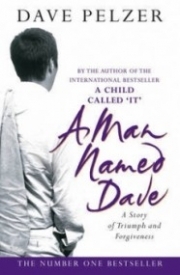 A man named dave is a book written by David Pelzer. He also wrote A child called it ( his years 4-12, I think) and The Lost boy (his years 13-18, I think) Anyways, a man named dave is taken place after the lost boy, so he enters the air force, has some troubles, meets a girl, has a kid, and meets a new girl. I enjoyed his first 2 books better, but i wasnt disappointed with this one.I'd recommend it to anyone, after they've read the first two, of course :). Breif Summary: The book A Man Named Dave is about a young man's battle to survive through his life having to face the problems of death, parenting, and life itself. As a child, the young man, Dave was abused and did not learn many key things about growing up normally and making his own decisions. It teaches you that no matter how unlucky you think you are, you can always fight back and be happy. This book is the third book in a trilogy. To read it you have to read the first two books, A Child Called "It" and The Lost Boy. Opinion: A Man Named Dave is a very good book. My favorite character is Dave's wife Patsy because she doesn't take life seriously until she finally realizes how serious life is when she has her son, Stephen. My favorite part is when Dave plays with his son, Stephen because it shows how bad Dave's parents were and how good of a parent Dave could be. Recommendation: A Man Named Dave is an autobiography. I would recommend it to children (boys and girls) ages 12 and above because their is some violence when Dave has flashbacks of his childhood. Overall A Man Named Dave is an excellent and well-written book.